today is the birthday of aldo leopold a towering figure in the fields of conservation and ecological ethics. leopold is considered the founder of the science of wildlife management and an important figure in modern ecology. ironically leopold died suddenly and unexpectedly when only 61 while helping control a fire which started when his neighbor's trash fire got out of control. his best known book, a sand county almanac (1949) was published posthumously by his children; it went on to become one of the landmark texts of american conservationism. I first encountered and read a sand country almanac in the early 1980s while living in the shadow of leopold's alma mater, the yale school of forestry. a wonderful book filled with deep love and advice for living in harmony and with respect for the earth - I highly recommend it, I think it's time to reread it - I know it's around here somewhere. Conservation is getting nowhere because it is incompatible with our Abrahamic concept of land. We abuse land because we regard it as a commodity belonging to us. When we see land as a community to which we belong, we may begin to use it with love and respect. 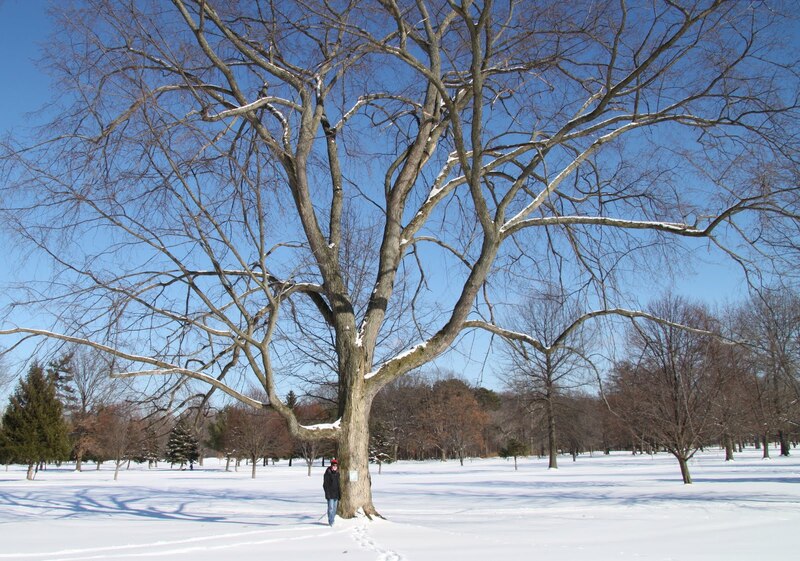 the tree in today's photographs is an american elm; what happened to this species serves is a example of what can occur when humans act carelessly with regard to our natural world. the american elm is a native tree of north america, at one time it was the preeminent urban tree, revered for both its graceful shape and its remarkable canopy which provides both shade and a sense of airiness. tragically in the 1900s a fugus which causes dutch elm disease was introduced into the country when infected logs were imported from europe. the first documented case of dutch elm disease in a live elm was found in cleveland in the 1930s - it was just a matter of time before the disease spread and wiped out most of the north american elm population. 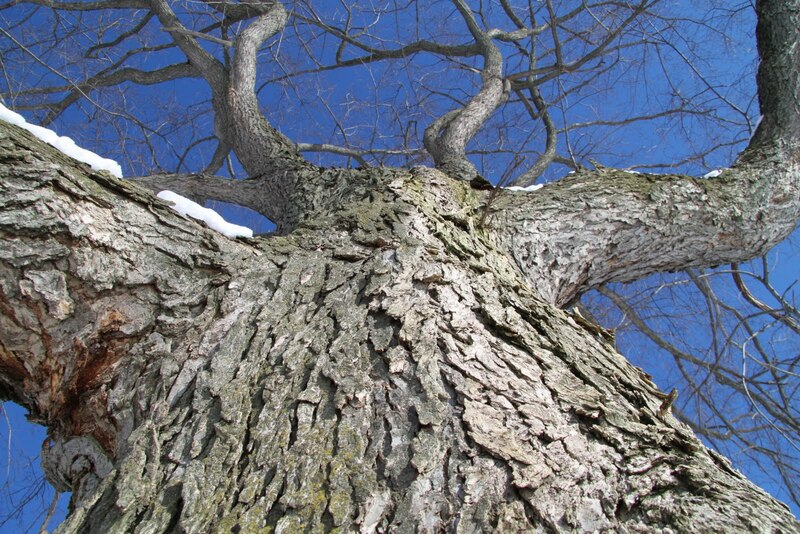 it is estimated that only 1 in every 100,000 american elms is resistant to dutch elm disease. 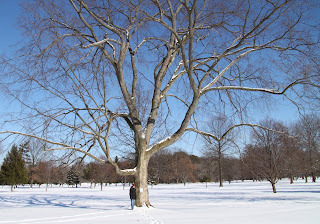 the tree in today's photographs is being cared for by cleveland metroparks save the elm program and this conservation program includes biannual application of a systemic fungicide, on-site monitoring, and supplemental watering. one of jackson browne's early hits, doctor my eyes (1972) provides biting commentary on the general state of things - social and environmental when folks don't care. Oh man, that song. Wow. I haven't heard it in a long time - what a great song, so evocative. LOVE the tree pic. That trunk is solid, grounded, beautiful. You're always such a repository of information. Never heard of him. Now I'm going back to the song. . . I have not heard of Aldo Leopold but I will definitely look him up. He wrote at the same time as Bernard DeVoto, another conservationist married to Avis DeVoto - I just read a book of her letters to and from Julia Child. I believe I've heard of the man - a person with a perspective on nature that was truly unique in the age he lived. It brought to mind an amazing book Lettuce lent me - The Prodigal Summer by Barbara Kingsolver. She writes about the plight of the American Chestnut. A quick google search told me that conservationists are breeding chestnuts which are blight-resistant so that the Appalachian forests can be re-populated. Great post title and also a fabulous song. I saw Jackson Browne in concert near Seattle last summer and he hasn't changed a bit, actually. He was a favorite of mine as a teenager, and still is.